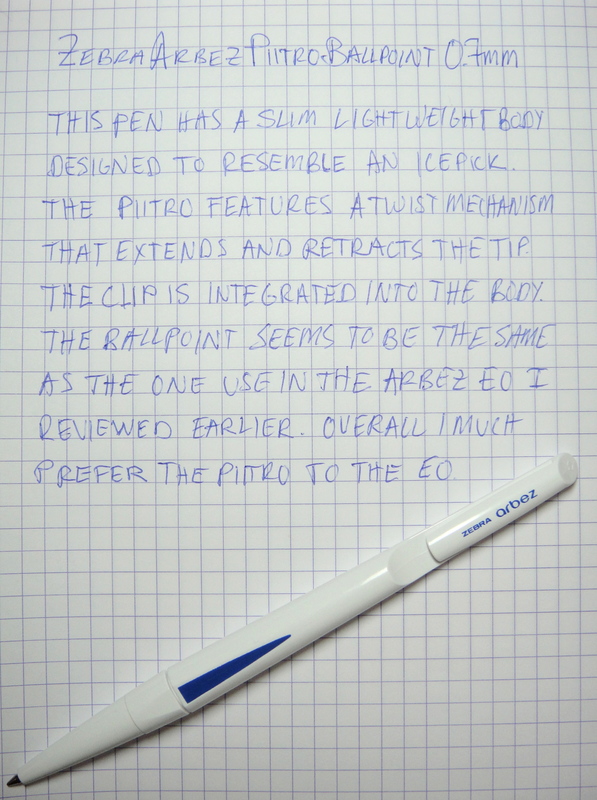 While I already wrote a review on Zebra Arbez EO, the Piitro was actually the first pen in the Arbez line. The Zebra Arbez Piitro was designed by a young Finnish designer to look like a icepick. The pens come in lightweight white or black plastic bodies with black, blue, or red ink. The ballpoint seems to be the same crappy one you get in the EO. This pen is more about the design (which I like much better than the Arbez EO) than the writing performance. The Piitro is different without looking like something made by Fisher-Price as the EO does. This pen features a nice twist mechanism and a plastic clip that is integrated into the main barrel section. There is a seam that goes right down the middle of the pen which is unfortunate and the top of the pen has some extra plastic but for $1.65 it’s not the end of the world.